This week’s offerings include kids’ toys and games, kitchen gadgets and cookware, bathroom organizing products and personal care items, keto/paleo-friendly foods, and a few random items for around the house. 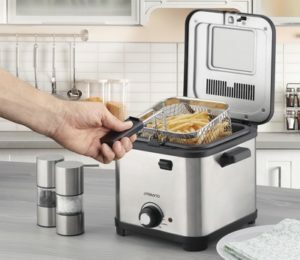 Ambiano Mini Deep Fryer, $19.99. This features variable-temperature control. Aldi’s mini deep fryer was recalled in 2018 because the heating element could overheat, posing fire and burn risks. Aldi appears to have fixed the problem because the mini deep fryer is back in stores. My family has owned Aldi’s regular-sized Ambiano Stainless Steel Deep Fryer for about a year, and it works well for us. Hasbro Classic Children’s Games, $8.99 each. Includes Scrabble Jr., Connect Four, and Guess Who? Reversible Construction Table with Chairs, $29.99. Features a reversible table top with a smooth side for arts and crafts plus a construction side. Play surface is compatible with common building block brands. Table also has storage area with 4 removable dividers for small parts. Storybook and Magnetic Drawing Pad, $6.99. Includes reusable pen and magnetic drawing pad. Assorted varieties. Bee Happy Construction Fort, $12.99. Quick connect (no tools needed). Easy Home Dual-Compartment Separator Bin, $69.99. Dual compartment easily sorts trash and recyclables. Features soft-close lid. Crofton Stainless Steel Splatter Screen Set or Steamer Insert, $4.99. Steamer fits pots up to 13.8″. Splatter Screen Set measures 11.4″ in diameter. Crofton Banana Hanger with Fruit Basket, $7.99. Crofton 2-Pack Trivet or Spoon/Lid Rest, $4.99. Easy Home Collapsible Dish Rack with Drainer, $7.99. Features 2-tier dish rack stand and plastic drain board. Foldable design offers storage flexibility. Crofton Chef’s Collection 12″ Stainless Steel Saute Pan, $19.99. Encapsulated base provides even heat distribution. Crofton Stainless Steel Utensils with Grip, $3.99 each. Easy Home 2-Tier Mesh Organizer with Dividers, $9.99. Choose Satin Nickel or Oil-Rubbed Bronze finish. SOHL Furniture 3-Tier Bathroom Shelf, $14.99. Measures 11.4″ x 14.8″ x 36.7″. Visage Body Fat Scale, $14.99. Measures body fat, muscle mass, and water content. Includes memory for up to 12 people (height, age, and gender). Easy Home Shower Caddy, $9.99. This hanging caddy measures 11.3″ x 4.4″ x 24.2″. Dentiguard Power Toothbrush, $4.99. Read our review of this toothbrush at this link. Easy Home Decorative Toilet Tissue Holder and Dispenser, $9.99. Measures 6.8″ x 6.4″ x 23.7″. Huntington Home Bowl Bouquet, $4.99. This fragrance for your toilet bowl comes in a 2-oz. container. Assorted scents available. Baker’s Corner Almond Flour, $5.99 for 16 oz. Simply Nature Hemp Seeds, $4.99 for 8 oz. Simply Nature Crunchy Peanut Butter Spread with Flaxseed and Chia, $2.29 for 16 oz. Health-Ade Pink Lady Apple or Maca-Berry Kombucha, $3.25 for 16 oz. Easy Home Crochet or Knitting Kit, $7.99. Assorted varieties available, including kits to create small stuffed animals. Huntington Home Faux Succulent or Plant Assortment, $9.99 each. Choose Succulent or Grass. Cement pot included. Succulent measures 7.5″ x 7.5″ x 5.5″. Grass measures 6″ x 4″ x 7″. Easy Home Personal Table, $12.99. Folds flat for easy storage. Thomas Farms Fresh Lamb Loin Chops, $7.99 per lb. Read our review of Aldi’s lamb loin chops at this link. Fresh Steelhead Trout, $9.99 per lb. Tyson Fresh Pork Roast Kit, $6.99 for 2.75 lbs. Ambiano, Baker's Corner, Bee Happy, Crofton, Dentiguard, Easy Home, Hasbro, Huntington Home, Simply Nature, SOHL Furniture, Thomas Farms, Tyson, Visage. Bookmark.